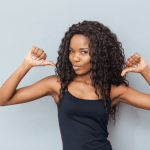 If you want a salon-like blow dry experience for your natural hair right at your home, it only makes sense to research all your options before investing in a new (and perhaps expensive) blow dryer. This here is your definitive guide to buying the best blow dryer for natural hair. Blow dryers, like curling irons and flat irons, are ‘heat tools’. This means blow dryers apply the use of heat to accomplish their mission. For you to accomplish your mission of maintaining the quality of your hair for longer, you need to know your way around such heat tools. Using the wrong tools or right tools in a wrong way can cause severe and sometimes, irreversible damage to your tresses. Many people ignore the various settings that come with heat tools like blow dryers and keep damaging their hair consistently, while the solutions sits right there on their own blow dryer. So, as a smart owner of a blow dryer, you need to understand the basic controls and settings that your device comes with – and which is the most suitable for your hair type. 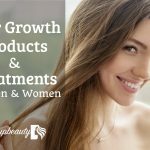 I’ve seen many ladies investing in really expensive blow dryers, only ending up spending even more trying to reverse the damage they managed to inflict upon themselves with such a simple tool. The first step to buying a blow dryer is to understand what it offers and if it matches your needs. There are various factors that make a blow dryer good or bad (for your hair). While low-end machines may not offer you the luxury of customizing all these factors, the more pricey brands usually do. This is the most basic of all settings that lets you regulate the amount of heat being applied by the dryer. I have come across several cheaper blow dryers that function with a pre-set heat setting that cannot be changed. ​However, I strongly recommend you to look for a﻿﻿ blow dryer that lets you switch between various heat conditions such as low, medium, high and a cool setting. A fixed heat setting may not be suitable for use at all times for natural hair and can cause long-term damage too. A simple rule of thumb you must remember is to use high heat settings if you have thick or coarse﻿ hair, and the lower heat setting if you have thin or frizzy hair. The only thing you need to understand about wattage rating is – the higher it is, the faster your hair will dry. Though it sounds simply convenient, professionals do not advise or encourage the frequent use of high-wattage devices as it can cause your hair to become overly dry and frizzy. Salons usually use blow dryers with a wattage rating of 1300 Watts. It is not very hard to find blow dryers in the market that offer up to 1875 Watts of power. Professionals across the industry encourage the use of ceramic or tourmaline hair dryers over those made using plastic or metal. Ceramic dryers work by exposing the hair to infrared rays that are perfectly safe and non-harmful, while ensuring even distribution of heat which ensures uniform drying of the hair. Tourmaline dryers too emit infrared rays like their ceramic counterparts, however with one striking difference. These blow dryers also employ the use of negative ion technology. What this essentially means is that the blow dryer will release several million negative ions in the process of drying which help breaking down the wetness (the water molecule) rather quickly but gently. This enables quicker drying of hair without cranking up the heat setting on your blow dryer and risking damage to it. Diffusers work by evenly distributing the heat of the dryer, and have long been popular amongst ladies that sport curly hair. But professionals also use diffusers to add body or bounce to hair with light, natural wave. Concentrators on the other hand work by focusing the air output onto a single area. This can prove helpful when trying to control frizz and obtain a soft - wavy look. Before buying your preferred blow dryer, it may prove useful to check if they offer replacement attachments for purchase at a later stage. All types of attachments including diffusers and concentrators must be immediately replaced if damaged in any way. Another tip to remember if you use blow dryers to style your hair frequently is to use heat-protectant hair products like lotions, serums and sprays to protect your hair from serious damage. Now that I’ve walked you through the essential features of any blow dryer, let’s have a look at some of the best options available in the market. An all-round blow dryer that offers a very near-professional blow dry experience right at home. This hair dryer uses the negative ionic technology. It gives you the freedom of choosing from two speeds and three heat settings – something I feel is more than sufficient for most natural hair types. 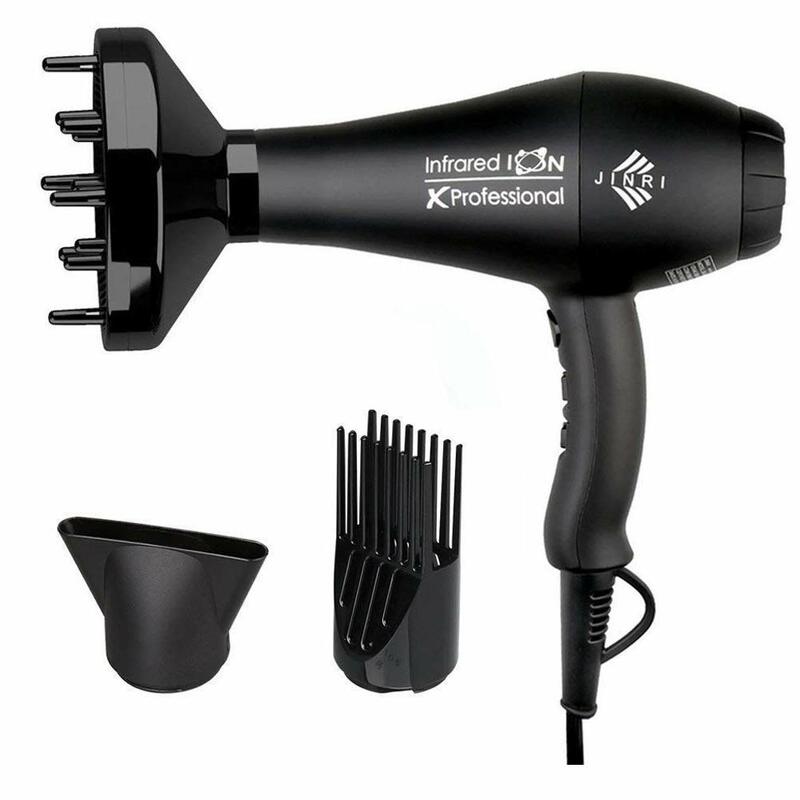 Unlike most salon grade blow dryers that run on an AC motor, this one uses a DC motor. This is because DC motors are known to have a lesser life and lower drying efficiency when compared to AC motors. Jinri is a relatively lesser-known brand, and you may feel more comfortable opting for a more well-known and established maker of blow dryers, if you are a first-time buyer. Another 1875 watt powered blow dryer, this machine also comes with two concentrators that snap on to the nozzle of the dryer, easily. Another small but useful feature of this product is the suspension ring it comes with, so you can easily hang it on any wall at home. Powerful 1875 watt rating ensure quick heating and performance. This dryer runs on an AC motor which means better performance and a longer life for your device. With 3-level heat control and 2-way speed, it is quite sufficient for home use. This product also comes with an ‘Auto-off’ feature that turns off the blow dryer automatically in the case of overheating, which is a nice safety feature to have. SweetLF offers a 30-day 100% cashback guarantee in case you are not satisfied with the product. The hair dryer is much larger in size compared to other dryers in the market which can make it a little inconvenient if you travel often. The SweetLF blow dryer is available only in one color option. You may feel stuck with the only option if you dislike pink. This great build quality of this dryer is the first thing you will notice out of the box. It is an 1875 Watt powerful machine that sports an AC motor. The dryer also comes with a concentrator attachment. Nexxus claims that their Italian AC motor results in drying hair almost 3X faster than their competitors. While I haven’t tested this out exactly, an AC motor is still your best bet while buying a dryer. The dryer is made from a Titanium-ceramic material which ensures even heating. I also found this dryer to be much quieter than most others I have used. It comes with one concentrator and one diffuser. This is especially convenient if you are looking to switch styles often. Like the SweetLF dryer, this dryer isn’t very light in weight which can cause portability issues for frequent travellers. The only feature I found absent was some sort of a light to indicate heating or cooling On/Off. A travel-friendly blow dryer, Conair miniPro offers 1200 Watts of power. It is much smaller in size than the other devices listed in this guide, and much lighter too. It also boasts a folding handle which makes it even more compact and great for traveling. It also uses the ionic technology for great results. Its small, compact and robust build make it a great travel companion. The blow dryer itself looks very trendy, young and cool. The miniPro is 120/240V compatible which is great when you are traveling to new countries. The 1200 Watt rating means that the blow dryer will take more time to generate heat compared to other products listed here. It also means it may not be the greatest product for you if you have thick or coarse hair. The miniPro offers only a two-level heat control. If you are not sure how much heat your hair may need, it may be safer to go with a blow dryer that offers more flexibility in the heat department. The attached cord is not very long and it may be an issue if the power adapter is far away. Another Jinri product features in this list. This Jinri dryer uses an AC motor in place of the DC motor. However, it offers the same kind of 3-level heat control and 2-way speed control. It comes with the same 1-year replacement and 2-year warranty as the first dryer in this list. The presence of an AC motor makes it a preferred choice over its DC motor counterpart, especially for the concern of a longer use life and quicker drying. Jinri also supplies a concentrator and diffuser with this product for ladies with curly hair, frizzy hair or for those simply looking to switch styles frequently. The power cord supplied with this blow dryer is 1.8 meters long which is great if the power cord is far away. The heat and speed controls provided are adequate for home use and most hair types. The use of negative ionic technology along with FIR (Far Infrared Rays) ensures gentle hair care through evenly distributed heat, without any delay. The warranty conditions offered are great and especially useful for sceptical first-time buyers. In conclusion, I suggest that both beginners and seasoned users go with the Nexxus Italian Motor Styling Tool. The Conair miniPro, though a great travel accessory, is no match to the power and finesse of the Nexxus for regular home use. The Nexxus beats the SweetLF dryer easily in terms of build quality and feel. While the Jinri dryers are good performers too, the Nexxus’ better quality and brand presence make it a better choice. The Nexxus Italian Motor Styling Tool is simply an all-round dryer that is powerful in its wattage rating, flexible in its heat and speed controls and employs the very efficient ionic technology for the best results every time. Did you find this review helpful ? Do you have any additional questions or comments ? Feel free to leave them for me in the comments section. Have fun styling !